Attach to a hero. Attached hero gains the Gondor trait. 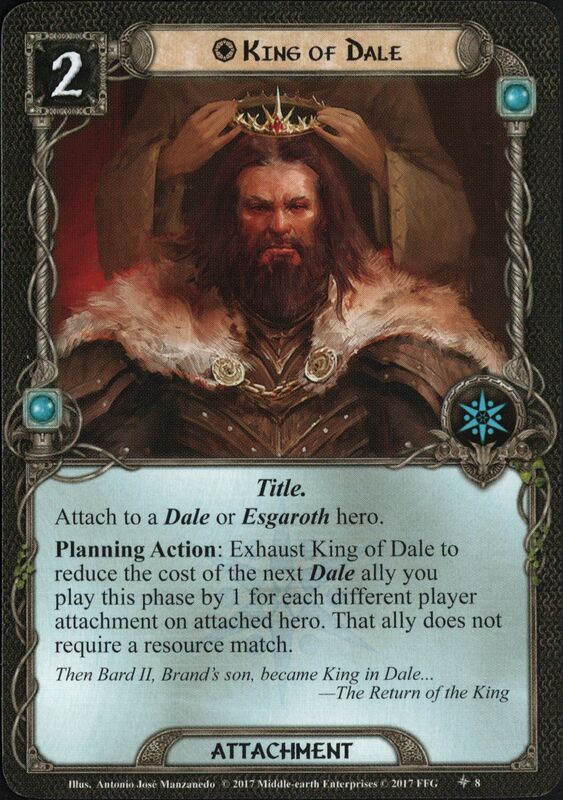 Action: Exhaust Steward of Gondor to add 2 resources to attached hero's resource pool. Attach to a hero. Action: Discard a card from your hand to give attached hero +1 Defense or +1 Willpower until the end of the phase. Limit 3 times per phase. Attach to a Noble hero. 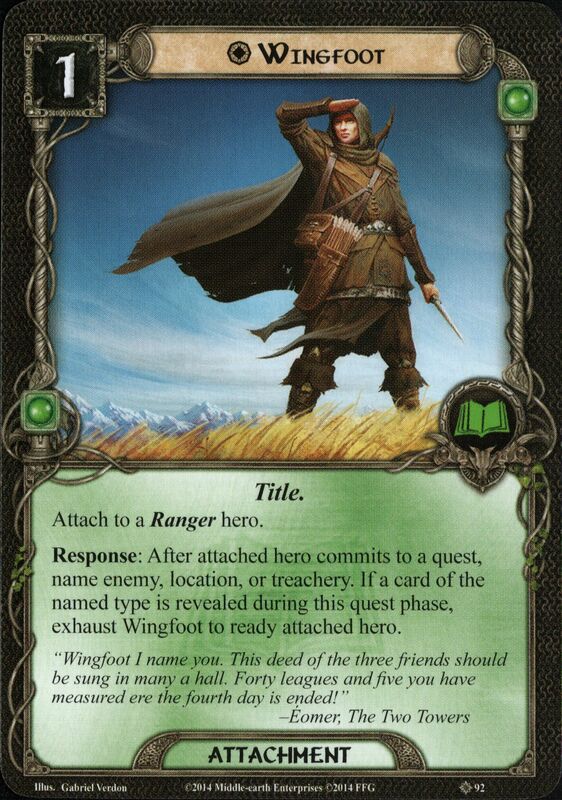 Response: After attached hero gains any number of resources from a card effect, exhaust Heir of Mardil to ready attached hero. Attach to a unique ally belonging to any sphere of influence. Attached character loses the ally card type and gains the hero card type. Attach to a Dúnedain hero. Planning Action: Exhaust Heir of Valandil to reduce the cost of the next Dúnedain ally you play this phase by 1 for each enemy engaged with you. Attach to a non-objective unique ally in play. The first player gains control of attached ally. Damage from undefended attacks against you may be assigned to attached ally. Attach to a Silvan hero. 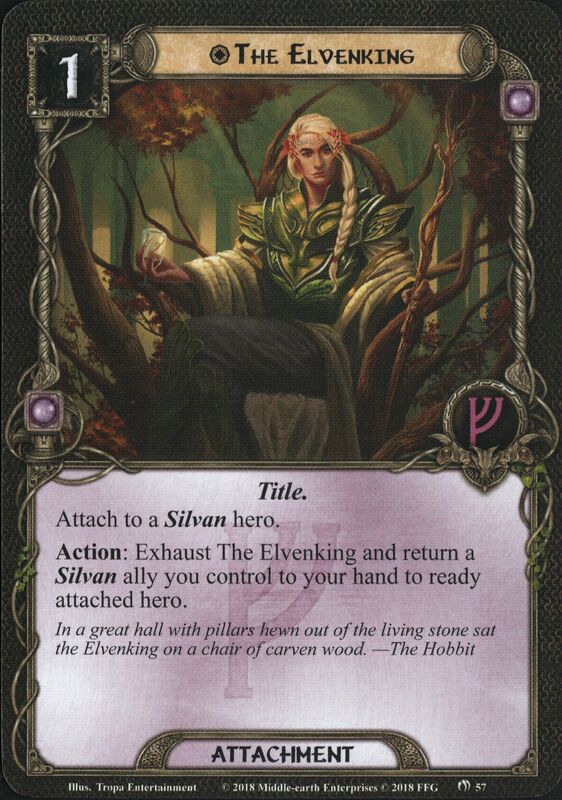 Action: Exhaust The Elvenking and return a Silvan ally you control to your hand to ready attached hero. Setup: Attach to a hero. Attached hero gets +1 defense and gains the Ranger trait. Setup: Attach to a hero. Attached hero gets +2 hit points and gains the Healer trait. Setup: Attach to a hero. Attached hero gets +1 Attack and gains the Warrior trait. Setup: Attach to a hero. Attached hero gets +1 Willpower and gainst the Noble trait. Setup: Attach to a hero. Attached hero gains the Rohan trait. Attached hero gets +1 Attack while attacking with another Rohan character. Setup: Attach to a hero. Attached hero gains the Gondor trait. Attached hero gets +1 Willpower while commited to the quest with another Gondor character.